From the perspective of the present day, Puritan-inspired capitalism seems to have succeeded globally, including in India. Connected to this, short-term profit-orientation in management seems to constrain the scope of different management approaches in a tight ideological corset. This article discusses the possibility of replacing this Puritan doctrine with the crucial elements of Indian philosophy: Karma and samsara. In doing so, the possibility of revising the guiding principles in capitalist management becomes conceivable, namely the monetary focus of profit-orientation and its short-term orientation. This perspective allows a detachment of the concept of profit from the realm of money, as the seemingly only objectifiable measure of profit. Furthermore it allows a removal of the expectation that every “investment” has to directly “pay off”. A karmic view offers management a possible facility for being more caring about the needs and fates of other stakeholders, as profit-orientation would no longer be attached as a factual constraint to merely accumulate money. In capitalist societies the concept of management is often linked to the idea of profit-maximization. Within organizations, then, different types of management are therefore only different strategies or approaches to maximizing the outcome of processes (Primeaux and Stieber 1994; Vranceanu 2014). Processes that involve working individuals, along these lines, thus have to be “managed” in a way that maximizes the output of these individuals (Guest 1997; Lepak and Snell 1999). In this context, these working individuals are usually considered as resources that, through adequate “human resource” management, can be optimized in terms of their contribution to operating income. This income, or profit, is usually measured in money. The management is then seen as some kind of investment into, e.g., employees, that through its return – in the form of enhanced productivity - should pay off (Toms 2010). The time horizon of this calculation is usually very small. Not every kind of management has to have an immediate impact, but, nevertheless, management related cost-benefit calculations only very rarely cover a timeframe longer than a couple of years (Marginson and McAulay 2008; Van der Stede 2000). Both the fixation on money as the only valid type of return on investment, and the narrow timeframe of these calculations display the short-term capitalism that in Western societies has become an imperative ideology that occupies more and more areas of people’s lives, with destructive consequences for both the individual (Sennett 2011) and society (Albert 1993; Heitmeyer 2001). Whether this approach, in the long run, is positive for the organizations themselves will only become apparent in the future, but as the fate of organizations cannot be understood as being disconnected from the individuals working for them, and the societies they are operating within, it can be assumed that for capitalistically structured organizations a rethinking of the essence of their profit-orientation might be worth considering (Aspara et al. 2014). Given this background, this article aims at developing an alternative karmic view of management that broadens the understanding of what other kinds of returns (on investments) might be conceivable, and of other possible causalities in which these returns might be embedded. Karma is a spiritual concept deeply rooted in many Indian philosophies that assumes that every physical or mental action has a consequence for the actor. As Karma is linked with the idea of reincarnation or rebirth (samsara), this consequence can either appear in this life or in a future life. The basic assumption of this causality is that every deed leads to similar consequences, albeit that the intention to act is more crucial for the karmic effect of an action than the action itself. Thus, the intention to harm or to promote another’s wellbeing will have an impact on one’s own wellbeing in this or in another life. Applying a karmic lens to management allows a radical shift in both the conceptualization of the parameters of ROI-calculations, as well as the causality-patterns in which the different returns can occur. Concepts, such as “Social Return on Investment” have already pointed in this direction (Arvidson et al. 2013; Costa 2013), but this article will structure these considerations in a more systematic way. One does not have to believe in reincarnation to appreciate the conceptual value that is inherent to a karmic perspective on management; it allows a step back to be taken from a seemingly broad agreement on the rationale of management within capitalist systems. This article will develop a new karmic perspective on management that then will be embedded into the discourse on capitalistic management again. 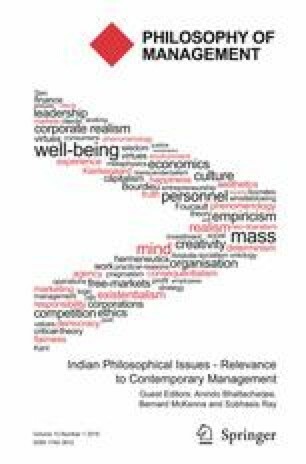 Up to now only very little research has been done on connecting Indian philosophy and management (e.g., Bhattacharjee 2012a, b). Thus, this article represents a quite new approach to management research. In order to be able to step back from the rationale of management in capitalist societies, one must first question how far the capitalist structure might already represent a religious belief system that differs from those systems of Indian philosophy. The most important (and most often cited) works within the discourse on this issue are Max Weber’s “The Protestant Ethics and the Spirit of Capitalism” which appeared in German in 1904/1905 and “Die Wirtschaftsethik der Weltreligionen: Hinduismus und Buddhismus” (1916) which was translated into English as “The Religion of India: The Sociology of Hinduism and Buddhism” (1958). The latter work was, and still is, controversial in discussion, as in Indian philosophical and sociological discourses it is interpreted in a way that suggests Indian society may suffer from a “deficiency” that keeps it away from the “blessings” of modern capitalism (Alatas 1963; Kantowsky 1982, 1985; Winckelmann 1982). However, Weber is far from being an advocate for the kind of capitalism that today seems to prevail globally. He clearly saw the inhuman and destructive side-effects of this ideology (Löwy 2007) that today has, more or less, also become the standard for the Indian economy (Gellner 1995; Münster and Strümpell 2014; Singh 2013). Therefore, it is worth looking again at his works (Buss 1984). Building on these insights, this article will question whether it is possible to replace the Puritan elements of the capitalist logic with key elements of Indian philosophy. In order to develop a new perspective on management it will be outlined in what way such a new capitalist logic as a precondition would affect the configuration of management. Weber is fully aware that this religious element is not the only “cause” of modern capitalism. However, he shows that the Puritan doctrine of predestination plays “an important role with several other factors in the great historical process which has resulted among other things in producing the modern economic order” (Parsons 1935: 688). Werhane (2000) for example identifies other elements of the “philosophies of modern capitalism” of today in the works of Adam Smith and Herbert Spencer - both authors writing more than a century before Weber. These elements can be labeled with such familiar and interrelated expressions as “laissez-faire capitalism”, “social Darwinism”, “survival of the fittest”, individualistic “cowboy capitalism”, or “night watchman economy” (Werhane 2000). However, both authors base their considerations solely on worldly phenomena as motives for individuals’ actions; largely on the pursuit of happiness and the avoidance of suffering. These actions, for both authors, then, are embedded in the idea of social or economic progress as measured solely by outcomes in this world, such as societal wealth or happiness, as opposed to potential outcomes in some form of afterlife. They do not take into account any kind of metaphysical question, such as the conditions of one’s salvation after earthly life, although this is a crucial concern for religious individuals. In terms of offering a spiritual or religious basis for capitalism, therefore, these approaches necessarily fall short. Both Smith and Spencer can be described as earthly-life centered “methodological individualists”. Thus, their main focus for explaining and understanding organizational or societal phenomena was on understanding the actions of individuals within these societies or organizations. For both authors, the modern capitalistic political and economic order primarily focuses (or should focus) on providing the room for development for individualism and individualistic striving in a libertarian way. This is a connecting point to Weber’s Protestant ethic. However, as will be outlined later on, contrary to Smith and Spencer, Weber shows the religious foundation of this individualism. In this context, this article discusses the possible shape of a capitalistic order that, instead of being based on a Puritan doctrine, would be spiritually based on the “Hindu doctrines of ethical compensation and reincarnation” (Warner 1970: 83), i.e., on karma and samsara. Around the year 1900 - the time when Weber wrote “The Protestant Ethic” (Weber 1958a) - it was already assumed that, in the USA and Europe, religion and religious belief held, in general, much less importance in people’s everyday life than they had in the 17th century, or even prior to that. This might be even more the case nowadays, where the process of its decreasing relevance seems still to be ongoing (Halman and Draulans 2006; Koenig and Wolf 2013; Schwinn 2013). However, Weber showed that, at least in the past, a certain religious belief provided a spiritual basis on which modern capitalism could grow. He identifies Puritanism as having provided the religious basis for structuring one’s life around systematic work and the infinite pursuit of material wealth and success - the two key elements for giving birth to what he calls the “spirit of capitalism” (Weber 1958a). Puritanism, as one type of Protestantism (in opposition to Catholicism), emerged in England and Scotland in the 16th century and became more strongly established in the thirteen British colonies on the North American Atlantic coast. After the Restoration of the monarchy in 1660, the influence of the Puritans declined in Britain, and many of them immigrated to New England. This laid the ground for their influential contribution in shaping the US American society, and with it, modern capitalism (Foster 1996; Vaughan 1972). The Puritan church is an ascetic Protestant church that strongly bases its doctrine on the ideas of Calvinism. However, it reformulated one of the central aspects of Calvinism. In contrast to Lutheranism and Catholicism, for Calvin, God was an omniscient and omnipotent deity that was totally separated from all living beings. God was seen as being a vindictive deity, always being ready to punishing erring humans, but inscrutable to these humans in terms of his motives (Weber 2015). Furthermore, this God had “predestinated for all time, and unalterable, only a tiny minority to be saved; everyone else was condemned to eternal damnation” (Kalberg 2010: 30). A believer’s salvation status was attached to him or her at birth and was in no way changeable. The Catholic sacrament of confession, and with it the possibility of experiencing absolution, was abolished by Calvin. Other activities of believers that aimed at changing their salvation status so that they might qualify as one of the “chosen few” to attain salvation, were not possible, for example, donating money to the poor or doing other things that might be pleasing in the sight of God (Arruñada 2010). For Weber, the eternal consequence of the unanswerable question, whether one is among the saved, left the devout in fear and despair. In order to control or to reduce their anxiety believers tended to search for any sign that could give them evidence of their future salvation. Although nobody could definitely know, much less change, his or her salvation status, the Puritan doctrine prescribes - in contrast to Calvinism - that believers should act as if they were indeed among the chosen few. Following this doctrine, humans’ only purpose in life is to glorify and honor God by overcoming the human status naturae (i.e., being spontaneous and impulsive and being guided by personal wants and physical desires) and striving to live a sanctified life (Kalberg 2010: 31–32). Being incapable of doing so would, as an outcome of “insufficient faith”, be a sign of not being chosen. On the other hand, the capability to overcome one’s selfish desires and living a life that is agreeable to God could be interpreted as being given from God, and thus as an indicator of being a chosen one – as otherwise God would have wasted this bestowal. “Thus, the individual could gain certainty of salvation only in being God’s tool. The strongest inner reward imaginable was thereby placed upon a rationale and moral systematization of life” (Weber, 1951 in. Kalberg 2010: 33). Puritans aimed at taming the status naturae by employing a dispassionate, restrained, and tempered mind-set as the basis for systematically rationalizing their lives. Being God’s tools, God desired them to work on increasing his magnificence on earth. It was concluded that this magnificence could be associated with wealth, and the capability of wealth production and its possession and accumulation indicated one’s salvation status. Thus, work aiming at generating wealth had the status of being a vocational calling, and a divine service (Brotheridge and Lee 2007). The more fruitful and profit-yielding one’s work was, the more it contributed to Gods magnificence. Together with the doctrine of having to tame the status naturae this led to the emergence of methodical work. “The religious value set on restless, continuous, and systematic work in a vocational calling was defined as absolutely the highest of all ascetic means for believers to testify to their elect status, as well as simultaneously the most certain and visible means of doing so” (Weber 1958a: 116). Personal wealth and riches that sprung from this work and the ascetic reinvesting and non-consumption of this wealth were believed to indicate one’s favorable salvation status, and therefore helped to allay the anxiety of individuals in the face of condemnation. For Weber, this Protestant ethic, which actually describes only the ascetic Puritan ethic, co-participated in the constitution of what he calls “the spirit” of modern capitalist. Although the Puritan religious basis has more or less disappeared these days, the status of work and the accumulation of wealth as an end in itself can still be observed. Weber calls this one-sided rational structuring of people’s life around their vocation and the related overwhelming concern about material things - which now has lost its religious spirit and fundament - a “stahlhartes Gehäuse” (Weber 2015: 123), usually translated as steel-hard cage or iron cage, of our times (Baehr 2001). Based on an ascetic restructuring of the world, material questions have now taken possession of humans’ pursuit and often come along as seemingly factual constraints. Now that the religious spirit has left, modern capitalism is stably based on a mechanical fundament (Weber 2015: 123). Weber leaves open the future development of capitalism: “No one knows who will live in this cage in the future, or whether at the end of this tremendous development entirely new prophets will arise, or there will be a great rebirth of old ideas and ideals, or, if neither, mechanized petrification, embellished with a sort of convulsive self-importance” (Weber 2015: 124 in Ritzenberg 2012: 122). Conceptually he leaves it open to the reader to think about other spirits that might conceivably move in into this cage. It is also left open, as to how far a new inhabitant of this cage might change the cage itself, and with it the ideological corset that gives acting within the framework of capitalism the appearance of being a factual constraint, or a necessity that is inherent to this “being captured in this cage”. Management within this constraint seems necessarily to mean aiming at accumulating profit and wealth. However, what this article is trying to do, is to contrast the way of salvation that seemed most promising under Puritan Ethics with the basic approach to salvation that is assumed to be the most promising according to Indian philosophy. Although there are differences between the various Indian philosophies and religions, there is one crucial doctrine that all of them have in common: the doctrine of karma. In terms of an individual’s path to salvation, the order of karma makes every human being the architect of his or her own fate, and therefore it is diametrically opposed to the Puritan doctrine of predestination that makes a human’s fate the will of God. Thus it is worth to considering how this fundamental principle of Indian philosophy would shape the iron cage that constrains the shape of management. It has been shown that modern capitalism, and with it the canonization of profit-orientation, can be interpreted as being based on Puritan values. Personal wealth, as a consequence of a permanent maximization of profits, was seen as a sign of being one of the chosen few, who – within the doctrine of predestination – will experience salvation in the afterlife. In this way, the wealthy and working individual could testify to themselves and to others that there is evidence for being not condemned by God, which helped to reducing the anxiety that was inherent in the perpetually pressing question of whether one would be among those few who were saved. As a life agreeable to God implied overcoming all personal egoisms and physical desires, ascetic rationalized work was seen as an absolute end in itself. Work kept one away from doing sinful things, and possessing the capability of working in this kind of “productive”, competitive, profit-oriented and rationalized way that allowed accumulating wealth, could as well be interpreted as a sign for being one of the chosen few. However, in a theological way all human action revolved around how to glorify and please God in the best way, whilst in a psychological way it was revolving around reducing the anxiety that was related to uncertainty about one’s salvation status. Life, in this Christian-Puritan view, is only one tiny period that is followed by another, eternal period of either salvation or condemnation, depending on the inscrutable and immutable decision already made by God in the moment a life came into existence. A “before-life” – life prior to earthly birth – does not exist in this two-stage view. This opens up the question as to whether another capitalism is thinkable that is based on another, totally different concept of salvation. Other Christian churches, Judaism, and Islam also have a kind of two-stage model that originates from only one short period of life and a subsequent afterlife. They furthermore have in common the monotheistic principle of only one God, who in some way decides on, or prescribes the rules for, an individual’s salvation (McCleary 2007; Wilson 2002). A totally different approach with totally different salvation theories can be found in Indian philosophy. Within Asia, as well as globally, Weber (1923) ascribes to India the status of being the cradle of spirituality and the center for religious development. “India is the typical land of intellectual wrestling for worldview [Weltanschauung] in the proper meaning of the word: for a sense of a living in the world. It can be assumed […] that in the field of thinking about the sense of the world and of life there is nothing that, in one form or another, has not been already thought about in Asia” (Weber 1923: 365, own transl.). Thus, it is worth considering more deeply this Indian philosophy and its underlying soteriology, in order to think about salvation theories that could be the spiritual basis for a modified capitalism, and thus for a reconceptualization of profit-orientation in management. The focus here is on the different concepts of Hinduism as the predominant religion in India, and as the point of departure also for other religions, such as Buddhism. Weber identifies the Hindu caste order as a crucial aspect that has prevented capitalism from emerging in India with the same intensity as it did in the Puritan USA. Nowadays castes seem to play a smaller role in the everyday life for Indian people, but they are still very important for many of them. The enacting of laws that forbid discrimination against members of lower castes and the launching of several affirmative initiatives might today have weakened its economic importance, but the caste system still exists (Desai and Dubey 2012; Hnatkovska et al. 2013). At the time when the industrialization of India was just beginning, certain rationalized work techniques, such as assembly-line work, seemed to be incompatible with the caste related duties (i.e., their caste dharma) of many castes. The change of an occupation would often have equalled a change of caste, and was therefore impossible (Deshpande and Palshikar 2008). As the Hindu tradition did not allow for creating new castes - which would be characterized by possessing new skills for new techniques - innovations developed only slowly and rarely (Smith 2008; Uppal 1986). For Weber, the overwhelming development of imported capitalism could not brush aside this anti-capitalistic precondition (Weber 1923: 101f). In 1918 Weber already states that through the British occupation “Indian society is already penetrated by capitalist interests in such a profound way, that it [capitalism] can hardly be exterminated anymore” (Weber 1923: 359, own transl.). In the end, for British businessmen it was obviously somehow possible to employ Indian caste-workers in modern factories, and to exploit Indian craftsmen capitalistically, “after having been able to import capitalism as a ready-made machinery from Europe. Nevertheless, it is the height of improbability that the modern organizational form of industrial capitalism could have emerged on the foundation of the caste system” (Weber 1923: 111, own transl.). Caste ritualism is fundamentally rooted in the karma doctrine, which makes Weber assume that a break with traditionalism by rationalizing the economy would to be impossible (Weber 1923, p. 122: 122). This karma doctrine points to the crucial question: what is it that made or makes Hindus adhere so strictly to their caste order? In answering this question one has to take a closer look at the Hindu soteriology. The basic assumptions of Hindu religiosity are firstly, the belief in transmigration and reincarnation (i.e., samsara) and, related to this, secondly, the doctrine of karma. Weber (1923) classifies these two elements as the only dogmatic doctrines in the whole of Hinduism that, in their interrelation, create the “specific theodicy of its social order: the caste order” (Weber 1923: 169). The doctrine of karma implies the dogma of inalterability of the world-order, which is common to all orthodox and heterodox Hindu theologies. Its underlying assumption is that every morally relevant action retroacts to the acting individual. Thus, no consequence gets lost. All ethically blameworthy or praiseworthy conduct of the individual comes back to him or her in the same proportion as the individual has acted by him- or herself. As these consequences can come back in a next life as well, this doctrine is connected to the doctrine of reincarnation. Thus, “within an infinite sequence of new lives and deaths, humans determine their fate alone by their own actions” (Weber 1923: 170, own transl.). Thus, the specie or the caste – as castes are ordered alongside a hierarchy (Dumont 1980) – one is born into, is always the result of personal conduct in a former life. Thus, everyone “deserves” to be in the caste one is born into. An individual’s concern about his or her reincarnation fate, therefore, tends to be a permanently guiding motive for action. Hinduism, in partial contrast to Buddhism, for example, regards sacrifices or the observance of certain rules as morally good (or their non-observance as blameworthy). Every caste has a special set of duties (i.e., dharma) and rites that every member has to obey, in order to receive positive karma, and thus, to potentially be reborn in a higher caste. For this life, however, one is fixed in one’s own caste. Weber calls this Hindu interpretation of the doctrine of karma “history’s most consequent theodicy” (Weber 1923: 120, own transl.) that politically stabilizes the hierarchical caste-order and stymies every attempt at social climbing in this life. Thus, based on the Hindu salvation doctrine, caste-loyalty and obeying the “ultra-traditionalist concept of caste-duties” (Weber 1923: 122, own transl.) was (and still is) acting in one’s own salvation-interest. It was not the continual repetition of lives that makes samsara quite unattractive for Hindu believers, it is rather the continual repetition of deaths that always comes along with painfully releasing tight bonds with beloved humans. In Hindu philosophy, leaving this painful circle of samsara - that is associated with the transience of everything in existence – can only be done by totally detaching one’s soul from karma-causalities. From a Hindu standpoint, this would be the only possible salvation that could be reached by a plurality of ways (marga), namely rites, ascetism, and enlightment (gnosis). The latter aims at totally detaching the material basis from one’s self (or from what one might mistakenly assume to be something like a self or individuality, one’s atman), and recognizing that atman and brahman are one and the same. The concept of brahman is the ultimate ground of the universe and it is the universe itself, it is an universal spirit (Chaudhuri 1954), “without form, indescribable, indefinable, and purely absolute” (Joshanloo 2014: 477). Once one is enlightened by this insight, one reaches the condition of Nirvana – as a state of being that is not related anymore to the world. Having reached the gnosis bestows upon the Hindu believer the “certitudo salutis” as the final destination of all human striving. Just as for Hinduism, for Buddhism and Jainism the idea of Nirvana as a place of salvation is basically the same. The “true knowledge” that is necessary to recognize the consubstantiality of atman and brahman, has to derive from one’s own experiences, which can be sharpened by conducting a moral life, practising rites, and being deliberated from worldly desires (Kim 1973; McCleary 2007). “The devaluation of the world that every salvation religion brings with it could here only become utter flight from the world, its highest means not the active asceticism of action, but mystic contemplation” (Weber 1958b: 521). “None of the plentiful different ethical schools has really questioned the prestige of this way of salvation as being the most valuable” (Weber 1923: 359, own transl.). Weber summarizes this way of salvation: “In the destinies of the soul, there reigns Karma, which is a determinism of ethical recompense. From it there is no escape save by flight, by means of the gnosis, to the realm beyond the world: the fate of the soul is either conceived of simply as “dissolution”, or as a state of eternal individual repose, akin to dreamless sleep, or as a condition of eternal calm blessedness of feeling in contemplation of the divine, or as absorption into the divine unity” (Weber 1978: 195). However, Weber (1923) found that the mass of Hindus understand ‘salvation’ (mukti) “only” as favourable rebirth. Corresponding to old Hindu soteriology, this is an individual’s own achievement (Weber 1923: 361), determined by the doctrine of karma. This also gives individualism in Hinduism a totally different shape compared to individualism in Puritanism. As individualism is a key-element of modern capitalism it has to be looked closely at its religious basis. Dumont (1983) emphasized the importance of religion in tracing the origins of “modern individualism”, a kind of individualism that Buss (2000) describes more precisely as “modern inworldly individualism”. This becomes clearer when examining more closely the Indian “path of salvation”, that aims at disentangling the self from all karmic causalities. When embarking on this path, one has to distance oneself from the social world. “The Indian renouncer [, therefore,] is self-sufficient, concerned only with himself, and in several ways he is similar to the modern individual. But there is one basic difference: the modern individual lives within the ‘world’, i.e., within society, whereas the samnyasin lives outside it. The samnyasin may therefore be called an individual-outside-the-world, or an outworldly individual, in contrast to the inworldly individual of the modern world” (Buss 2000: 4). Weber identifies the Puritan doctrine of predestination as one key source for the emergence of inworldly individualism (or inner isolation) (Beetham 1989), since believers had to work for the glory of God during this life, in order to individually assure oneself one’s salvation status. Besides producing inworldly individualism, this doctrine also produced an “ethical personality”. Ethical behavior, in this sense, was largely behavior that aimed at overcoming the status naturae. An ethical personality, then, would be a personality that channels the individual’s behavior in a rational and methodical way, controlling any kind of “animalistic” impulse (Weber 1958a). Possessing, or achieving, this personality can, for the individual, be interpreted as a proof of being one of the chosen few. However, this coexistence of the “ethical personality” and “inworldly individualism” disappeared in the course of centuries in the same way that Puritan religiosity disappeared. The individualistic “social structure turned into an ‘iron cage’, as Weber said, and individuals turned into ‘specialists without spirit and sensualists without heart’” (Buss 2000: 16). However, individualism remained, and can, still, be the basis of capitalism. It can be seen that the Indian way of salvation differs fundamentally from its Puritan counterpart, and with it the notions and shapes of individualism. This opens up the question as to how a capitalism would look, that was based on this Indian way of salvation. And, if such a capitalism were to exist, what implications would this have for management? Puritanism assumed one’s salvation status was already unalterably pre-determined. Thus, besides being based in Puritan rules, ascetically rationalizing one life around one’s vocational calling, accumulating profit, and insatiably striving for wealth derives from the psychological need to handle ones anxiety that is due to the uncertainty of one’s salvation status. Personal wealth, as well as one’s capability to make profit could be interpreted as signs of being one of the chosen few, and therefore both could make one’s individual anxiety a little more manageable. However, within the Puritan system, humans could never have ultimate certainty about their salvation status in their earthly lives. Although having different interpretations about what salvation means, Hindus and believers of many other Indian belief systems, on the other hand, can very well experience this certitudo salutis within their lifetime. This is the case, if one has experienced enlightenment and reached the gnosis. The enlightened individual then can be sure of having left samsara, and thus, of having attained salvation. Thus, for individuals the pursuit of salvation would not legitimize rationalized productive work and the accumulation of monetary profit. Precisely the opposite would, in fact, be the case, since enlightenment and gnosis could be reached instead by mystical contemplation. This involves more a detachment and separation of oneself from the world, rather than engagement in it and trying to transform it in a “productive” and rationalized way. Furthermore, there is no anxiety due to one’s uncertainty about (and inability to influence) one’s salvation status, since everybody has it in his or her own hands to make further steps into the direction of leaving samsara, and thus proceed in the direction of salvation. Therefore, the psychologically moderating effect of productive, rationally oriented work as distracting from this anxiety would not have an impact. This last step of salvation, then, that runs via mystic contemplation, is hardly compatible with any kind of capitalistic structuring of people’s lives, in the way in which it would be understood in modern capitalism. Profit, in this last step, could only be a “profitable” insight that helps one go one step further in the direction of enlightenment. Although these insights have to come from oneself and not from another person, other persons can help and support the individual on his or her way. In Buddhism, especially, gurus play a central role in the individual’s process of enlightenment. Salvation-based, profit-oriented management then could only be providing others with the time and seclusion that is necessary for mystical contemplation, or providing others with philosophical and theological wisdom. For managers this would not be a service without return, because they would receive a positive karma for supporting another’s salvation. And it is exactly this positive karma that offers several further connecting points for revising capitalistic profit-orientation in management in an Indian way. Although the final goal on one’s way to salvation is to have no karma left at all, the “accumulation” of positive karma remains the mainspring of the believers’ spiritual acting. The majority of Hindu believers, anyhow, understand ‘salvation’ “only” as a favourable rebirth (Weber 1923), and this rebirth is determined by karma. For management the karmic order can have several implications. The basic assumption of this order is that every action comes back to oneself as positive or negative karma. One could say that any kind of return-on-investment calculation and prognosis would be obsolete in this case, because the return will come back anyhow, and its magnitude is exactly equal to that of the investment. For the individual this might be true, but organizations – in Indian belief systems – are in no way entities that are capable of experiencing salvation or having karma. They are “only” entities that organize individuals’ collaboration (or competition), but all of these individuals are themselves capable of experiencing salvation. The organization is only the platform or the framework for individual actions that produce karma. Profit-orientation of management within organizations, then, is expressed by individual actions of managers that have internalized this orientation. However, it is still the individual manager who is acting and producing individual karma. On the individual level there might be a striving for a preferably prompt return or profit on whatever he or she has initiated or “managed” in economic terms. This might be due to the desire to reap the fruits of one’s labour within the organization as soon as possible, for example by being promoted or receiving a monetary bonus. Thus, individuals’ “life planning” of accumulating as much wealth, reputation, or power as possible within the period of working promotes the short-term profit-orientation in business. However, if one applies a karmic perspective to this behaviour, this short-term orientation does not make any sense. Besides not needing any signs to testify to one’s salvation-status or karma-balance, it would, in any case, never be measured in money, power, or reputation. From here the two crucial aspects of a potentially karmic view on profit-orientation in management can be derived: The question about the essence of “profit”, and the question about the timeframe within which this profit comes can be generated. In terms of what “profit” would mean in a “karmic” view, the only valid answer can be: positive karma. This profit then is not immediately linked to a “return”, but having positive karma would be something akin to being the creditor of a debenture, that guarantees a return in the future. However, this profit (or return) would not necessarily be a material profit. It could also be an emotional state, an insight, health, the wellbeing of friends and relatives, a favourable rebirth or even salvation. The “investment” in this calculation can be every intentional action, especially when this action has an impact on other persons’ wellbeing or on the wellbeing of an animal. Management, therefore, always produces karma, as management per its definition is an intentional action. As the intention is more important for karma than the action itself, from a karmic viewpoint, managers would be more motivated to care for others and to look after the persons over whom they had responsibility. Generally, every person has the same value. Thus, for one’s “karma calculation” it does not make any difference, to which person one were to do good or bad to. This is an important point when it comes to issues that are easy to brush aside, or to being regard as not being germane to one’s area of responsibility, such as the working conditions of the factory labourers of one’s suppliers. As soon as an amelioration of the wellbeing of others is within one’s scope, it can become a variable in one’s karma calculation. Therefore, a karmic view might enhance one’s willingness to feel responsible for others, even in the case of not directly working together with them. The same enhanced awareness of responsibility would be related to product development or to marketing management. As both have an impact on many people (i.e., customers and consumers), managing would focus much more on really altering their wellbeing through the services or goods provided by one’s organization. To put it briefly, from a karmic viewpoint, management in general would revolve much less around the manager him- or herself, and with it, around his or her egocentric, material desires and needs for admiration. Management would focus much more on other persons, direct stakeholders, or even persons that are not directly linked to one’s organization, and their needs and wellbeing. A karma-oriented management would allow compassion to be a valid incentive for profit-oriented management activities. In this context, actions being based on the “sole” purpose of reducing other people’s suffering or enhancing their wellbeing would then no longer conflict with capitalist pursuits (Köllen 2015). This could form the basis for a more conscious capitalism (Mackey and Sisodia 2014), that enables management to calculate with “social” returns in investment as well (Engelke et al. 2014; Shaw and de Bruin 2013). In terms of the timeframe in which this “profit” would come back, the only valid answer can be that one cannot say, but one definitely cannot expect to receive this “profit” in this life. It could be that it might come back in this life, but, equally, it could appear in one of the next lives. However, one can be sure that it will come back 1 day. Thus, in the final analysis the timeframe is not important at all, as one cannot influence it anyhow. For “modern” management, short-term orientation in calculating and expecting an investment’s return would lose its legitimizing ground. The situation would no longer be about accumulating material profit and wealth within the short time of one earthly existence; rather it would be about accumulating positive karma within an unpredictable span of many lives. From the perspective of the present day, Puritan-inspired capitalism seems to have succeeded, not only in Europe and North-America (Dyck 2014; Dyck and Wiebe 2012), but globally, including in India. Connected to this, profit-orientation in management seems to constrain the scope of different management approaches in a tight ideological corset. However, it is worth thinking about the possibility of replacing this Puritan doctrine with the crucial elements of Indian philosophy, namely karma and samsara. In doing so, the possibility of revising the guiding principles in capitalist management would be conceivable, namely the monetary focus of profit-orientation and its short-term orientation. This perspective allows a detachment of the concept of profit from the realm of money, as the seemingly only objectifiable measure of profit. Profit, from a karmic perspective is the accumulation of positive karma, and karma does not equal money or material wealth. This brings into play the equal consideration of the wellbeing of others, without having to define this as the “responsibility” of a manager – rather, it springs from the karmic view itself. Furthermore it allows a removal of the expectation that every “investment” has to directly “pay off”, as these will, in any case, ultimately “pay off”. A karmic view might offer management a possible facility for being more caring about the needs and fates of other stakeholders, as profit-orientation would no longer be attached as a seemingly factual constraint to merely accumulate money. In an economic environment where “modern” Puritan capitalism being the structural principle seems to be closed to debate, it may appear utopian to propose a karmic view as being a valid alternative perspective to be taken seriously. However, using Weber’s metaphor of capitalism as an “iron cage” which has lost its religious spirit: “No one knows who will live in this cage in the future”. Maybe, in future, Indian philosophy can contribute to spiritually (re)animate this cage.